This module is about a particular effect of the frequency, which is the stroboscopic effect. The lesson discusses and demonstrates low frequency phenomena - less than 16 Hz - that can usually be observed clearly by the human eye, as well as high frequency phenomena - more than 25 Hz - that are difficult for the human eye to catch. This video also explores and demonstrates how high frequency phenomena can be observed by freezing the fast moving phenomena using a device called a stroboscope. The only prerequisite for this video is that students understand the definition of the frequency of a periodic phenomenon. The video segments take up 17 minutes, so the total length of the lesson would depend on the amount of time spent during the in-class breaks. This lesson could certainly be completed during a 50-60-minute class period. Materials needed for this lesson include: a piece of paper or cardboard; a pen or a pencil; adhesive tape; a toothpick or a small stick; and a notebook with blank pages. 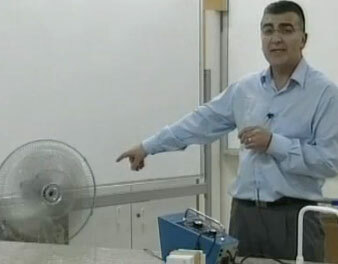 (If available: a function generator, an AC power supply, connecting wires, a LED, a small lamp, a fan or ventilator (with blades), a flashing stroboscope) Examples of in-class activities between segments include discussions of frequency phenomena and the building of simple devices that demonstrate those phenomena. Mr. Abu-Aqeel earned Master degrees in Solid Mechanics (France) and in Photonics (Canada). He has done research involving the Bauschinger effect in stainless steel, semiconductor optical amplifiers. This is a Wikipedia discussion on the Persistence of Vision phenomenon. This article discusses the cognitive process of perception involved in animation as well as the history of animation basics. This page has an excellent discussion of the Persistence of Vision phenomenon as well as the history of animation toys and directions on making those toys. This is a Wikipedia discussion of the Stroboscope. Fun facts and helpful hints about strobe lights.